Our gourmet cookie pops make great party favors for any occasion. Our jumbo 4" cookies are baked fresh daily with all natural ingredients and individually wrapped to preserve that freshness. Minimum order is 12 cookie pops per design. Choose pops that are all one flavor or choose various flavors. Message tags are printed on color laser printer then applied to heavy card stock and cut. Tags are tied to cookie pops with color-coordinated curling ribbon. Specify ribbon color at checkout. For custom requests, please call our customer service line. Make your next party or event extra special with our cookie pops! 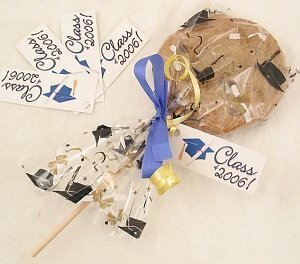 NOTE - The graduation bags are no longer available, your cookie favors will come with a graduation tag and clear plastic favor bags.